Thailand is now a constitutional monarchy though its particular form is unique and defies comparison with, for example, the United Kingdom. Although absolute powers were dissolved in 1932, the role of the King has not been reduced to a figurehead. For som understanding of this rare state of affairs, of the nature of the Thai monarchy with its blend of semi divine status and strong paternalism -- dual elements that trigger enormous devotion and deep respect among the common people -- it is necssary to take a glance at the country's historical development. Thailand, like its immediate neighbours, achieved nationhood through the authority of Kingship and the symbol of power emanating from the royal palace. The regal idea was inherited from the ancient Indian concept of the god-king which infiltrated peninsula Southeast Asia during the first centuries of the Christian era. 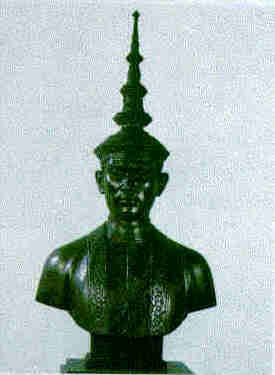 Such a form of kingship reached its highest expression among the Khmer of Angkor who held sway over the region in the centuries immediatly prior to the ascendancy of the Thai. It was partially inherited by the Thai when they established their first capital at Sukhothai where Brahman priests were maintained at court to minister to the pattern of semidevine kingship. (Even today Brahmans continue to conduct the major royal ceremonies.) Yet, largely through the influence of Theravada Buddhism, there were significant modifications in terms of the accessibility of the monarch and his paternalistic stance. This was first made clearly manifest during the reign of King Ramkamhaeng (c 1279-1298), the first of a handful of Thai monarchs, including the present King, to be accorded the title 'The Great'. A stone inscription made by him in 1292 tells how the differences and disputes of commoners as well as princes and nobles were settled at the Sukhothai court. "At the gateway there is a bell hung up. If anyone of the public has a complaint or grievance of body or mind to place before the King, it is not difficult. He goes to sound the bell that is hung up. 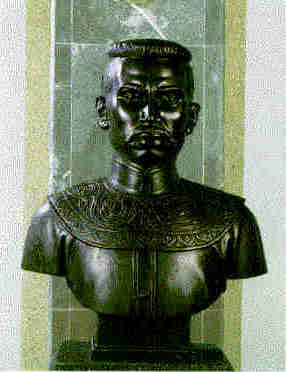 King Ramkamhaeng hears him call and, on questioning him, makes and upright investigation for him." When Ayutthaya, the second Thai capitol, eclipsed Sukhothai the monarchy became more remote, surrounded as it was by a complex system of court ritual and ceremony. Nevertheless, the essential idea of a benign power radiating from the royal palace persisted. There were periods when the character of the monarchy changed to meet the needs and pressures of the historical moment, but its role as a cohesive force binding the nation together has remained a constant through seven centuries and 55 reigns. Indeed the strength of the monarchy has benn the strength of the nation. 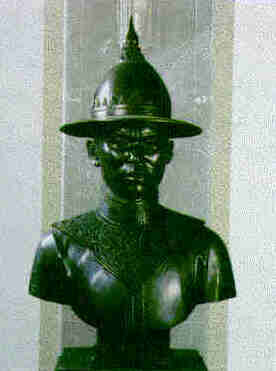 In the political realm this is amply illustrated by such notable kings as King Naresuan (1590-1605> and his heroic struggle against the Burmese; King Narai (1656-1688) under whose rule the power of Ayutthaya reached its glorious zenith, and King Taksin (1767-1782) who rallied a shattered nation after the Burmese destruction of Ayutthaya in 1767. In the modern era, beginning with King Rama I and the founding of the present Crakri dynasty in 1782, the Thai monachy has successfully steered the nation through periods of unprecedented change and, at times, strong external threat. It was, for example, largely due to the wisdom and astuteness of King Mongkut, King IV (1851-1868) that Thailand managed to avoid the colonial fate that befell its neighbours without exception in the 19 th and early 20th centuries. A brief history of Thailand, Holiday Time in Thailand, sep. - oct. 1986, P. 38. Thai Dress Through The Ages, by Bonnie Davis, Living in Thailand, sep. 1991, P. 14-15. The Longest Reign, by John Hoskin, King Bhumibol the Great - See the Highlights of the Royal obligation, Thailand, P. 43-46.